We have three games for you this week. So I better get started. 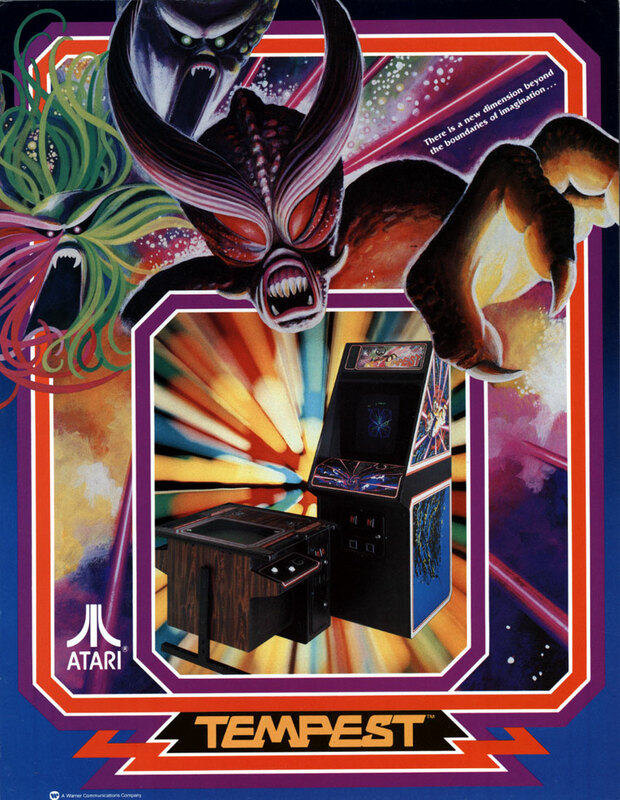 The first game for this week is Tempest. Tempest is a tube shooter style game, in which your main aim is to survive as long as possible. You control a yellow spacecraft on the close end of the field. The enemy spin on the far end on the until they hit the field. The field is split up into multiple segments which you and your enemies attach too. Once the enemy is on the field you are able to destroy them. Your spaceship is equipped with two weapons to help you fight off your enemies. Your first weapon is a rapid-fire game and the second is called Superzapper. The Superzapper can be used once per level to destroy all enemies that are on the field at the time, the Superzapper is also able to use used a second time on a level but will only kill one random enemy. When all enemies are destroyed or reach the end of the field you will travel to the next level by flying through the field. When traveling to the next level you must avoid or destroy spikes that have been left behind by enemies. There are sixteen unique levels with unique geometric shapes which same are closed tubes and others are open fields. 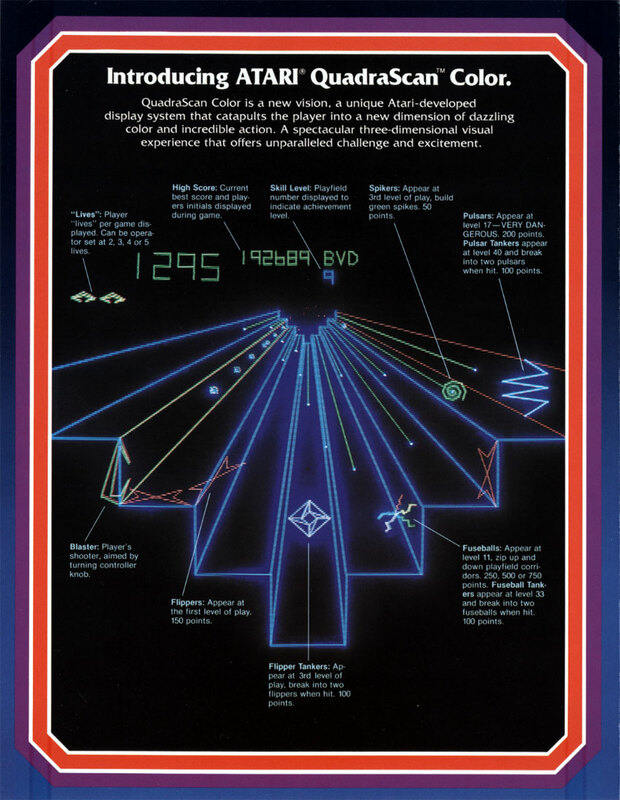 When all sixteen levels are completed the level sequence is repeated with a different colour scheme and set to a harder difficulty level. Flippers, a bow-tie shaped enemy that is able flip from segment to segment. Once they reach your end of the field they begin begin flipping directly toward you. Tankers, a diamond shaped enemy that move only directly towards your end of the field and is unable to change segments. When destroyed or near the end of the field, it will split into two other enemies. Their are different types of Tankers in the game finding more difficult Tankers later in the game. Spikers, a Spiral shaped enemy that move up and down the segment of the field they are attached too. They leave a spike behind them and if allowed to reach the far end, they reappear as Tankers. Fuseballs, are multicolored sparks that move up and down the field along the edges of segments, then move slowly across segments. When near the end of the field they are only able to be destroyed by using the Superzapper. Pulsars, a zig-zag shaped enemy that expands and contracts, they move similarly to Flippers. It electrifies the segment that is is attached too at regular intervals. If there is multiple Pulsars on the field they will all do this in unison. If the you occupy or enter an electrified segment you will be blown apart. Our second game is Who Dunit. 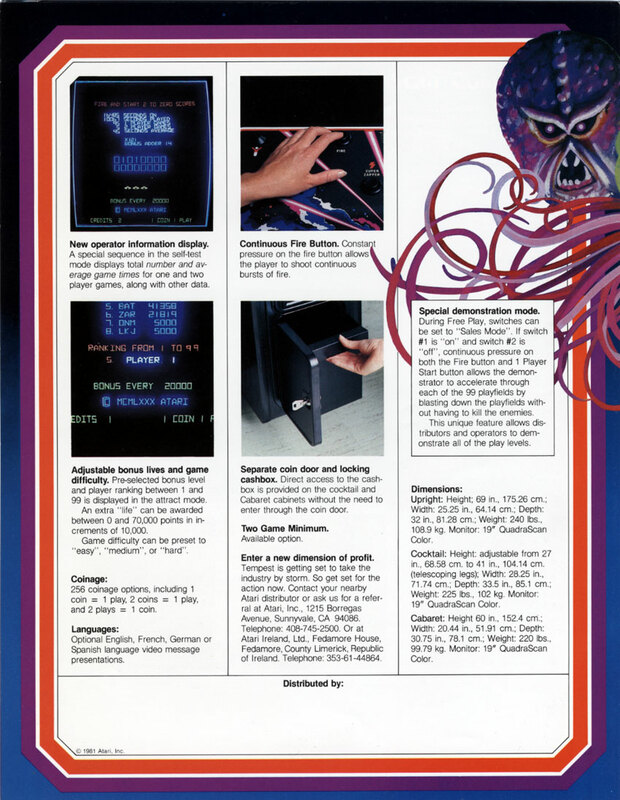 Who Dunit was released in the year 1988 and was developed by Exidy. 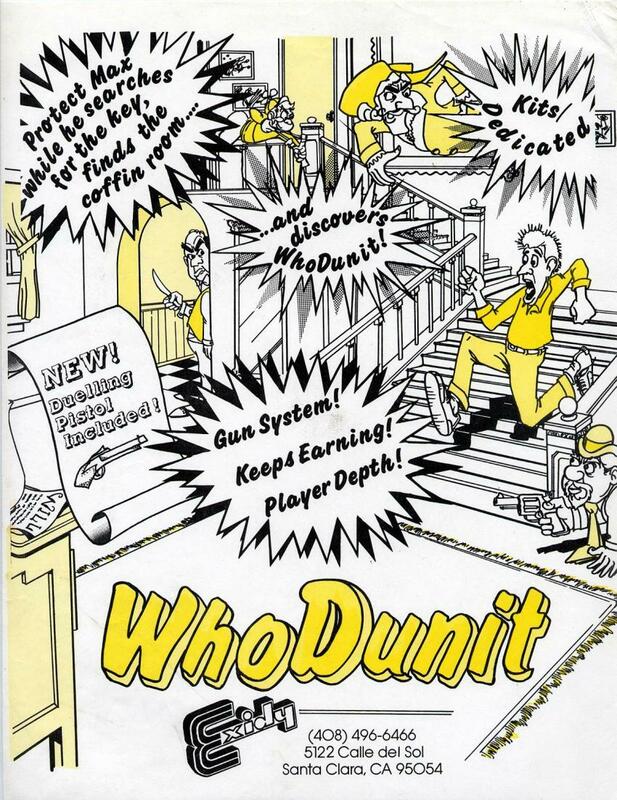 Who Dunit is a screen shooter game. In this game you do not directly control the main character (Max). However you (and a friend) use a gun to shoot objects and people that get in the of Max's quest. You also use the gun to change which exit Max will take but he will make his own path to that exit. The plot of the game is a murder mystery in which Max is trying to find out who dunit. You need to find the key and then the secret doorway to the attic and then open the chest to find out who dunit. This is not as simple as you might think as you only get to see the map once and only for about twenty seconds max. You will also find many enemies running at your, throwing stuff at you, random things in the scene dropping on you and more. The third and last game for the week is Super Casino. 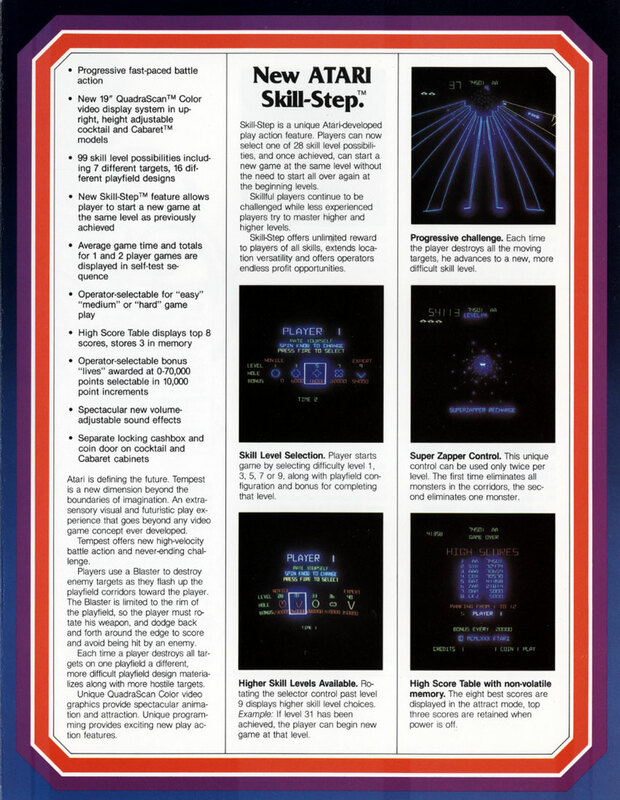 Super Casino was developed Data Amusement and released in 1984. Super Casino is a card/casino game. There are four games within Super Casino for you to play. If you choose one of the casino games first you are then not able to return to the heart's desire game but you can go from heart's desire to the casino games. Joker Poker, is a simple single draw single player poker game in which you bet and aim for the best hard you can to win extra credits. If you win a hand you can take your winning or try your hand at double or nothing. Double or nothing is a simple Hi-Low guessing game. Black Jack, is the same as any Black Jack game. Where you try to get/be closer to 21 then the dealer. Beat The Spread, uses a 52 card deck and Aces are high.If the first two cards are a pair your bet is returned and a third card is dealt trying for three of a kind. It the spread is zero a third card is dealt and bets are returned for any pair. Heart's Desire, is a game to know weather or not your wish will come true. First you must pick either the King of hearts or Queen of hearts to represent yourself. The cards will then start shuffling while this is happening you are to think of your wish. When you are ready you stop the cards shuffling and the deck will then be divided into three stacks. The game then searches for the King or Queen (depending on which you had chosen) and the nine of hearts and depending on their placement depends on if your wish fulfilled of not. If your credits reaches zero you will enter a Hi-Low game (the same in double or nothing) to try and win a free credit to continue.